Cashanova mens suit & tie. Money talks! By wearing Cashanova you can really show them what your worth. Perfect for an interview on Wall Street or when you accidentally find yourself in Vegas. 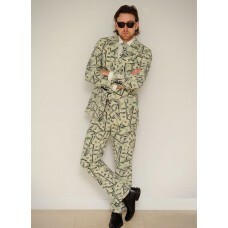 This suit is richly endowed with 100 dollar bills and comes with the matching tie to look like a million dollars.